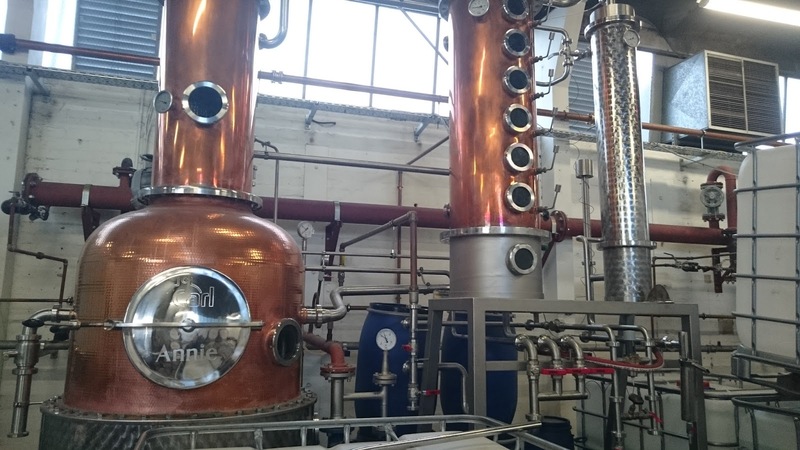 The Glasgow Distillery, a trip into the unknown. I’m not really one for distillery tours, I find them all very samey, you wander around, you usually watch some wee video on the history of the place and you get a couple of drams and a visit to the gift shop. I’ve done roughly twenty distillery tours, mainly when I lived in Aberdeen, being half cut most of the time made living in Aberdeen almost bearable, and whilst the extra special tours will allow you in the deepest darkest areas sampling the rare and exotic, maybe fill your own bottle, that sort of thing, each to their own but it’s not my thing. That said when the lovely Kat from Whisky Discovery and my dear friend Whisky Lassie invited me to the new and mysterious Glasgow Distillery and as I live in Glasgow how could I refuse such esteemed company? Now, you’ll spot most distilleries by their pagoda style towers or the smell or the great big building in the middle of nowhere in the Scottish Highlands, The Glasgow Distillery, not so much, to say we got lost going around roundabouts and the wrong way up one way streets on an industrial estate on the outskirts of Glasgow, I honestly didn’t know Glasgow had so many shops selling light fittings and carpets, but I do now. So now we’re here at a small warehouse style unit with no sign of the wonders going on inside apart from a couple of barrels and pallets lying about outside. Once we finally find our way in and meet up with Liam Hughes the CEO and Co Founder of the Glasgow Distillery we are shown inside for a look about and to try some of the good stuff. 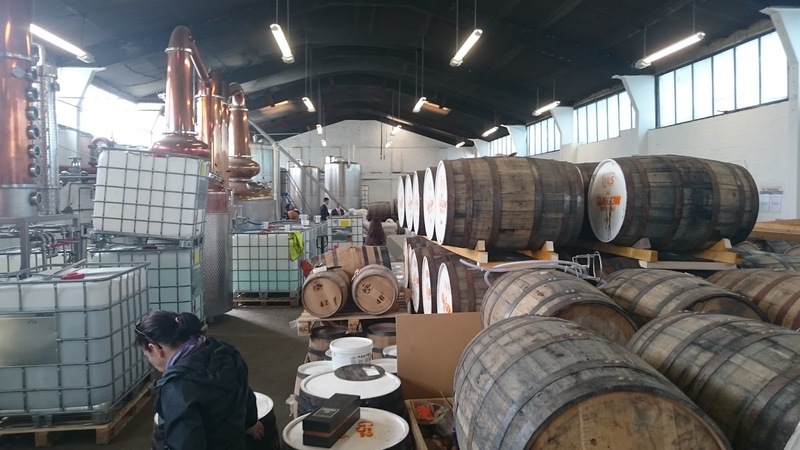 Liam waxes lyrical about his passion for whisky and wanting to bring back distilling to the city, there used to be dozen of whisky makers in Glasgow and the surrounding area and now there is next to nothing. Now Whisky Lassie will be doing a proper in depth write up which I’ll share when it happens so if you’re wanting to know about grain types, yeast and all that stuff I’d wait for that. 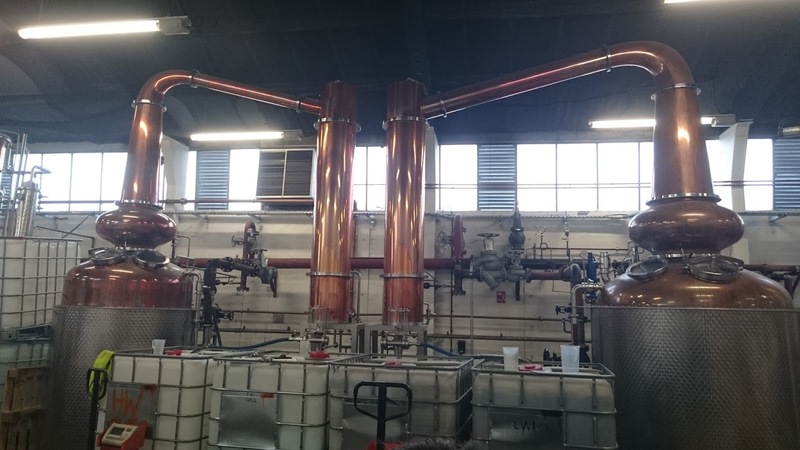 We were shown around the distillery and got to see their shiny Gin making machine, which was very pretty and their Pot Stills which just look amazing in this most unromantic of locations. 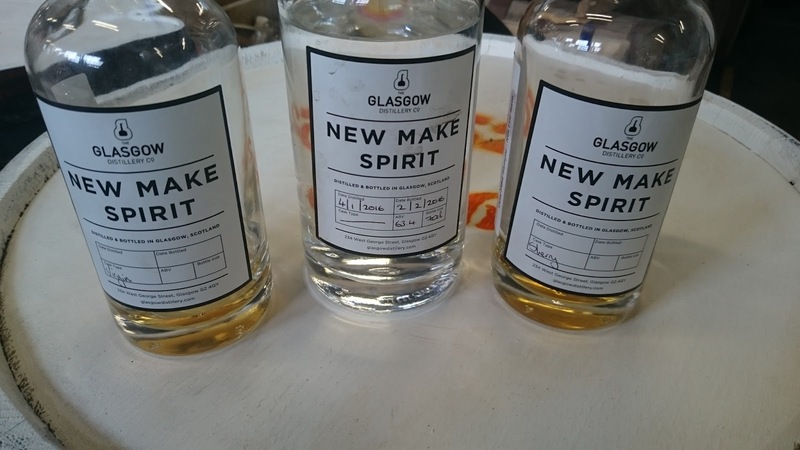 For us to try three bottles were laid out, the first was the New Make Spirit, a citrus and alcohol affair which is coming off the stills at 63.4% and whilst you know it’s spirit it isn’t as harsh as some of the moonshine I’ve had over the years. Next up we had two spirits which have been maturing in different casks, the Virgin oak spirit had been sitting for six months and had some wonderful, wood, oak and vanilla notes but my favourite was the nine months old sherry cask number. This had been matured a tiny wee sherry barrel and now at just nine months old it already packed an enormous sherry hit, I don’t think my companions were overly impressed with this and in fact Liam did say the spirit had now been taken out of these small barrel to languish in something much bigger to allow it to relax but I thought it was brilliant, it was basically a sherry bottled at forty plus percent, lovely. Next up we tried their Maker Gin, named after the official poet of Scotland Maker is a more traditional Gin, Juniper lead and I liked it, I’m not really a gin drinker but if you like the more traditional take on gin then might well be for you, there was also a lovely chilli and white pepper note too, it was certainly a very well thought out affair rather than just bunging some stuff in some new make as a lot of gin seems to be, to me anyway, if you have another opinion please let someone know, not me though. 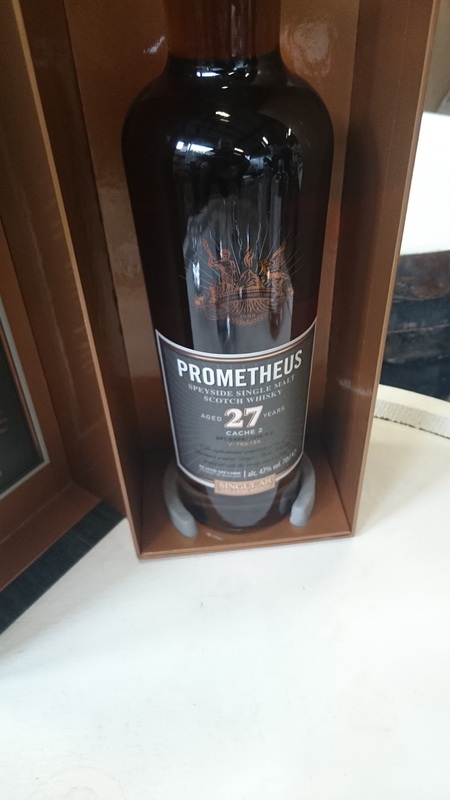 And finally we got to try the Prometheus, not, sadly, named after the film this twenty seven year old bottling is the second of the series, had been bought in and beautifully presented by Liam and Co and was a very complex affair, too complex for me to figure out after just one or two sips but a treat none the less. Liam wouldn’t tell us where it was from but I thought it was like a cross between old Macallan and Mortlach with a touch of Highland Park, it will of course be none of these and certainly not a blend of them. This isn’t a tour as such, it was a look around for us and they don’t do tours although they do plan on doing something in the future. Thanks again to Liam and the rest of the team who showed around, I wish them all the very best for the future and can’t wait to get my hands on a bottle or two of their first true whisky over the next few years. And remember that for now you can get involved by buying a bottle of Makar Gin, go on, it’s Summer time after all. Previous The Enlightenment, a dram Voltaire would be proud of. Next Cask Islay, a bargain Islay dram.